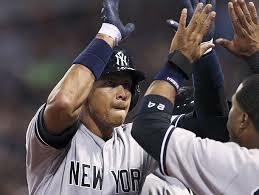 Last nights’ New York Yankees vs. Boston Red Sox game may be a pivotal turning point in the Yankees season. In the ‘pitch heard around the world’, Alex Rodriguez was beamed with a 92 MPH fastball on a 0-3 count by Red Sox pitcher Ryan Dempster. Rodriguez finished the night 3-for-4 with the home run, two RBIs and two runs scored. Rodriguez is now hitting .319 in 47 at-bats this season. After missing behind A-Rod on the first pitch of the at bat, Dempster came in high and inside on pitches 2 and 3. Finally, with a 0-3 count, Dempster unleashed a fastball, hitting A-Rod on the left elbow. Umpire Brian O’Nora immediately warned both benches, meaning if the Yankees wanted some payback of their own, their pitcher would be ejected. Luckily for the Yankees, they found the sweetest payback, in coming back and rallying behind A-Rod for a much-needed win to keep their playoff hopes alive. Seeing Girardi get ejected and standing up for ‘the most hated player in baseball’ right now can easily be a turning point in their season. Girardi was livid that his team was warned, and that Dempster intentionally threw at Rodriguez after missing the first 3 times. A-Rod also got some sweet revenge by going deep on Dempster to cut the score to 6-4. While rounding the bases, A-Rod clapped his hands after passing first and was seen shouting obscenities (not sure who it was directed to) after passing third. A-Rod then stepped on home plate, looked to the sky and kissed his hands, taking a ‘Big Papi’ like celebration. Dempster exited the game in the 6th inning to a standing ovation. It was the first standing ovation I have ever witnessed to a pitcher who went 5 and 1/3 innings, with 7 earned runs. Dempster tried proving a point that he does not like what A-Rod stands for, but he cost his team the game, and also opened the door for a sleeping giant. One thing in sports is that you never want to give a team extra incentive, and that is exactly what Dempster did by drilling A-Rod. It was a busch league move, and he should have been thrown at after hitting Rodriguez. Maybe it worked out better that he was not ejected, as the Yankees rallied around A-Rod and gave Dempster the loss. Either way, Dempster proved that he is not a tough guy, as he ran away after the benches cleared. The next time the Yankees play the Sox is on Thursday, September 5th. I am not sure if the umpire will warn both teams before the start of the game, but look for the Yankees to exact some revenge for the busch league move by Dempster.